SIR ELTON JOHN AND LEON RUSSELL RECENTLY convened in a Los Angeles recording studio with producer T-Bone Burnett, a select group of studio musicians, and a pair of Yamaha grand pianos. The result: an unprecedented collaboration between two musical giants. The album, titled The Union, features all-new material co-written by Elton, Leon, and Elton's longtime lyricist, Bernie Taupin. John and Russell hadn't previously recorded together, though they've admired each other's music for 40 years. When Elton erupted onto the music scene in the early '70s, Leon was at the apex of the rock world, scoring hits with his solo albums and serving as a high-profile sideman for such artists as Joe Cocker and George Harrison. Leon's hometown of Lawton, Oklahoma, may have been a world apart from the London suburbs where Elton came of age, but the two shared many musical passions-most notably, a deep love of vintage rock-and-roll and R&B. As Elton began his 40-year string of hits, Russell's songwriting was generating a string of classic albums, not to mention huge hits for other artists, from the Carpenters' "Superstar" to George Benson's "This Masquerade." But Russell would merit a pedestal in pop history even if he'd never written a single song: As a member of the Wrecking Crew, L.A.'s fabled A-team of studio musicians, Russell played piano on hundreds of classic tracks throughout the '60s, supporting pop vocalists (Frank Sinatra, Bobby Darrin, Wayne Newton), rock bands (the Byrds, the Beach Boys), and R&B greats (Sam Cooke, Aretha Franklin). It's almost impossible to calculate the collective musical legacy of these two men-and they're both still going strong. We recently had a chance to talk to Elton and Leon about their collaboration, and the 40 years of mutual admiration and influence that preceded it. THERE ARE INTERESTING PARAL LELS BETWEEN YOUR CAREER AND LEON'S. Elton John:We both started learning the piano when we were little boys. He played piano in a nightclub at the age of 14, and I played piano in a pub at the age of 15. We both went on the road in our late teens, and have both been out there pretty much ever since! YOU DEFINITELY SEEM TO HAVE SHARED SOME MUSICAL AND THEMATIC INTERESTS BACK WHEN YOU WERE STARTING OUT. 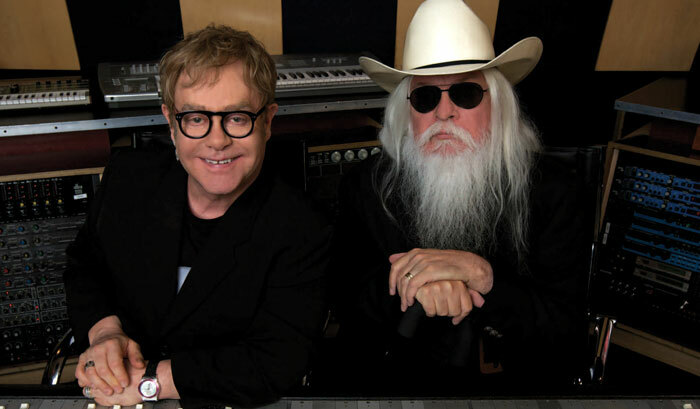 I can't stress enough how significant an influence Leon Russell was on the music of Elton John and Bernie Taupin. In 1970, when we first went to America and I played the Troubadour, we were obsessed by Leon's music, and looked up to him as some kind of musical god. On the second night of the Troubadour concerts he was there in the front row, but luckily I didn't spot him until near the end of the show-otherwise I would have been a nervous wreck. After the show he invited us to his house. We were very apprehensive because we really thought he was going to tear us off a strip and show us just how the piano should be played! Needless to say he was a fabulous host, and we came away not quite believing we had spent the evening with him. HOW DID YOU MAKE MUSICAL SPACE FOR TWO PIANOS ON THE RECORDINGS? DID THE TWO OF YOU TRACK SIMULTANEOUSLY, SIDE-BY-SIDE? We started the album in November 2009 with the initial writing sessions in Los Angeles. Our pianos were set up to face each other. I was playing the Yamaha DC7 Disklavier, and Leon played the Yamaha Modus H01 Digital Piano. The following January we went into the studio for the recording sessions. At first we tracked together with me in the piano booth and Leon outside in the studio using the H01, and we kept eye contact through the glass. However, we weren't happy with the different piano sounds, so we changed around. I played my parts on the DC7, and then Leon went in and recorded his parts on the DC7 too. The DC7 was recorded in mono with the two tracks panned right and left to separate them. We used the MIDI capabilities of the DC7 extensively in the production and recording process. DO YOU HAVE ANY OTHER OBSERVATIONS ABOUT THE INSTRUMENTS? As ever, I love the sound of the Yamaha as a pure acoustic piano. It's also great that with Yamaha technology we can use the MIDI signal to trigger other sounds. 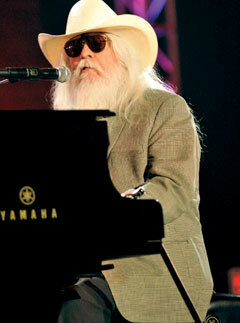 WHAT DO YOU ADMIRE MOST ABOUT LEON RUSSELL'S MUSICIANSHIP? Most of all I admire his songwriting and his piano playing, but there is so much more to Leon. Looking over the Atlantic from Britain, we read about many wonderful rock-and-roll moments. Joe Cocker on the road for the legendary 1970 Mad Dogs and Englishmen tour? Leon was in charge of the band. "Delta Lady," Joe's tribute to Rita Coolidge? Leon wrote it. Delaney & Bonnie and Friends? Leon was one of the friends. Shelter Records, the label that became a home for George Harrison, Steve Winwood, Tom Petty, and Eric Clapton? Leon co-founded it. Ray Charles, the Carpenters, B.B. King and George Benson recorded Leon's songs, and in 1973, at the height of his rock-star fame, he had the audacity to release a country album. Leon is a consummate musician who is still, after 50 years, at the hub of where great music is happening. Leon Russell: I think it's great. I really appreciated Elton asking me to do it. I hadn't really talked to him in about 35 years. He called me from South Africa, I think. He was listening to some of my songs, and then called back and said something about doing a duet album. It was a treat to have T-Bone Burnett there, too. He's quite a creative guy, and I'd been really impressed with the records he's made. SO YOU AND ELTON KNEW EACH OTHER BACK IN THE '70S? Yeah. Elton opened a couple of shows for me. The first time I saw Elton sing at the Troubadour in L.A., I thought to myself, "My career's over!" He was just so fabulous. Later he told me that he saw me out there, looking like the proper rock-and-roll star, and he said he was real nervous. But boy, he's incredible, any way you cut it. THE ADMIRATION MUST BE MUTUAL! 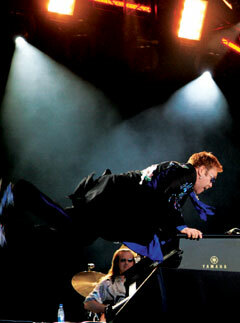 Elton shamelessly promotes me as the greatest piano player in the world. [Laughs.] I asked if he'd ever heard David Foster and Peter Nero, but I'm happy for the accolades. WHAT WAS IT LIKE TO WRITE WITH ANOTHER PIANIST/COMPOSER? It was great. We'd never written together, or even played together at the same time. But the first thing we played together actually turned into a song called "Dream Come True." It was quite fun. YOU SEEM TO SHARE INTERESTS IN MUSICAL AND HISTORICAL AMERICANA. Yeah. Bernie Taupin raises quarter horses, and he's an American Civil War expert. I used to be so jealous because Elton had Bernie writing those lyrics. Lyrics were so hard for me to write. Sometimes I'd sit there for months trying to get an inspiration. Meanwhile, I heard how they would bring in a stack of Bernie's lyrics to Elton, maybe fifteen or twenty. He would be in the studio with the drummer, and he'd just pick them up and sing them. If he didn't get something right away, he'd throw it away and go to the next one. Elton works very fast. I was about an hour late for our first day, and he wrote five songs while I was on the way down there. He's also quite a collector and historian. I saw a television program where he had this long room filled floor to ceiling full with CDs. I remember how he picked out five every day and listened to them all day. He's quite a student of music. It's impressive. SOME PEOPLE WOULD BE SURPRISED THAT YOU DESCRIBE YOURSEL F AS SEARCHING FOR INSPIRATION. Well, when I first started out, I was real serious about writing songs. They all had to be real-that is, they had to be about real experiences and real people. And that's great, if you got those things to write about. But if you don't, and you need some songs, you're in trouble! [Laughs.] But then I read some books about songwriting. I don't remember the titles, but I remember one line in particular that helped me: "In every prose artist, there's a failed poet." And it kept talking about how poetry was so much more difficult to write than prose, which I'd never really thought of before. The author talked about the problem of the blank page-how when you're starting a song, it can be like trying to be the artist and the audience at the same time, which is impossible. You keep criticizing your ideas till you have a big wastebasket full of paper. I eventually learned not to criticize myself that way, and now I can write at the drop of a hat. They're not all great songs, but I can write them in much larger quantities, instead of one or two a year. DOES THE WRITER REAL LY KNOW WHICH SONGS ARE THE GOOD ONES? OR IS THAT FOR THE WORLD TO DECIDE? I used to think I knew which ones were good, but then I realized that I don't know. Sometimes you write something and think, "Well, that's not great," and then 65 people record it. [Laughs.] So who knows? Anyway, it's not brain surgery. It's pop music. YOU'VE PLAYED ON SO MANY CLASSIC RECORDINGS. DO CERTAIN SESSIONS STAND OUT IN YOUR MIND? BUT YOU WERE CLASSICALLY TRAINED. Yes, but I had an upper-vertebrae injury during birth, and my right side has always been slightly paralyzed. So piano lessons were disappointing. I took lessons for ten years, and then I'd see some kid playing Carnegie Hall after three years of lessons. All my life I've had a hard time figuring out how to play things. I think that's the reason I started composing my own music when I was three or so. I think if I'd had two good hands, I'd probably be selling insurance today. WHEN YOU STARTED MAKING YOUR OWN ALBUMS, YOU EMPLOYED SOME FORMIDABLE SESSION TALENT YOURSELF. I had a record label caller Shelter with my partner, Denny Cordell. We went to England to cut my first record, and he introduced me to Glyn Johns, who was the Beatles' engineer. I said something like, "Boy, it would be great if Clapton could play on this." And Glyn said, "Well, I'll call him up." [Laughs.] And he called Eric. And he called George Harrison. And Ringo. And Bill Wyman from the Rolling Stones. And a bunch of other people. It was really a lot of fun for me. Actually, we tried to sign Elton to Shelter back then, but we missed him by a week, and he'd signed with another label. IN EARLIER YEARS YOU PLAYED ACOUSTIC PIANOS, BUT LATER ON YOU PLAYED MOSTLY ELECTRIC AND DIGITAL PIANOS. WHY THE CHANGE? Pianos are heavy and hard to move. But if you don't tour with your own, you never know what you're going to get. That was why I liked the Yamaha CP-70 electric piano. I had three or four of those, and played them for years. They were all great, every one of them. Yamaha has always understood mass production-every Yamaha I've ever played has been great. With other pianos, you might have to play 25 of them before you find a good one. Anyway, Elton had his Yamaha there at the recording, and I ended up playing it all the time. It made me realize that I have a lot of vocabulary on a wooden grand piano that just doesn't come out on electronic keyboards-a lot of classical shtick, for example. WHEN YOU LISTEN BACK TO YOUR MUSIC, ARE THERE PARTICULAR TRACKS YOU LIKE THE MOST? I actually don't listen to music very much. There are some exceptions-I have a new duet album with Willie Nelson that I've been listening to a lot. But I'm not a listener like Elton is. I was with him somewhere and this new band came in. Somebody was telling Elton who they were, and he said, "I know them," and started talking about how much he liked Track 5. He's such a consistent student of music and such a hard-working guy. He plays all over the world, and plays constantly. While we were doing the album, he played in Johannesburg, St. Petersburg, and Berlin, and then he would fly back and pick up whatever we were doing. [Laughs.] I'm just a piker compared to Elton!